Khichedi or Rice, lentils and mixed vegetable rice | Authentic Vegetarian Recipes | Traditional Indian Food | Step-by-Step Recipes | Give Me Some Spice! Khichedi is another traditional Gujarati dish. Khichedi is one of those dishes you make at home for your self but don’t tend to serve it to guests – although it is now becoming fashionable to serve it “kathiawadi” ( a region of Gujarat) food in certain restaurants. Its a dish one usually makes when they aren’t feeling well. It’s a very easy to eat and digest kind of a dish. It’s also the dish babies are introduced to when they start eating solids. It is usually made from an equal mixture of rice and split mung beans. I mix my Khichedi or Rice, lentils and mixed vegetable rice with one part rice to two parts lentils and keep it in a bottle. 1. Mix the rice and mung bean lentils and wash them well. 2. Add 4 cups of water to the mixture and start cooking the Khichedi or Rice, lentils and mixed vegetable rice on a medium heat. 3. Add the salt and turmeric to the mixture. 4. Add the mixed vegetables to the mixture. 6. Add a couple of tablespoons of butter to the khichedi, cover the dish and allow to cook on a low for 20 minutes. Khichedi is usually cooked until it becomes soft and mushy but shouldn’t get too dry. Keep checking to make sure it doesn’t stick to the bottom of the saucepan. 7. 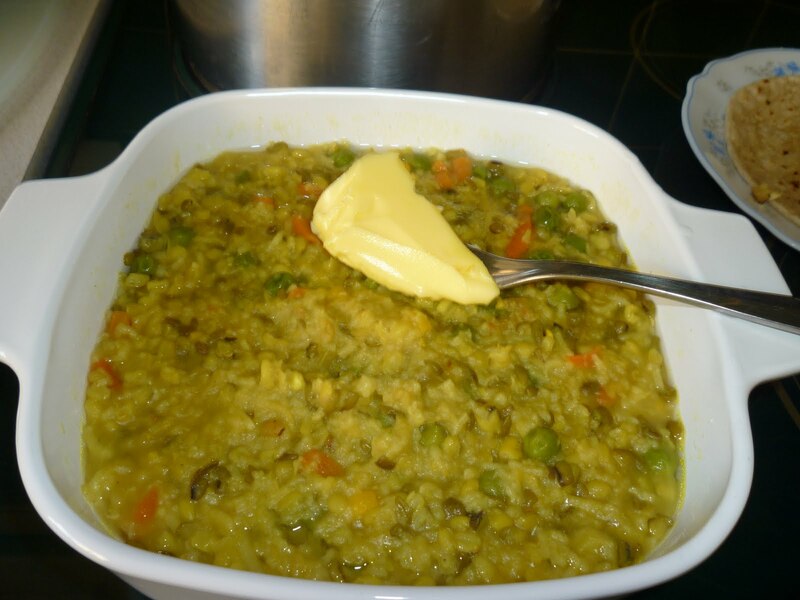 Khichedi or Rice, lentils and mixed vegetable rice should be served hot with a knob of butter. It can also be eaten on its own but the true kathiawadi style is to eat it with some potato and onion curry, Chapattis and papad! !.